Published in 2010 with ISME, ITTO and project partners UNESCO-MAB, UNEP-WCMC and UNU-INWEH, this atlas provides the first truly global assessment of the state of the world's mangroves. 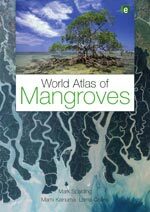 Written by a leading expert on mangroves with support from the top international researchers and conservation organizations, this full colour atlas contains 60 full-page maps, hundreds of photographs and illustrations and a comprehensive country-by-country assessment of mangroves. Contact Earthscan for sales details. 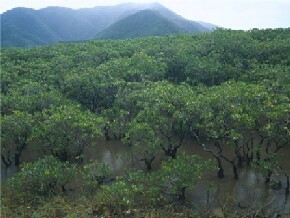 Mangroves are the characteristic littoral plant formations of tropical and subtropical sheltered coastlines. They are variously described as coastal woodland, tidal forest and mangrove forest. Generally speaking, mangroves are trees and shrubs growing below the high-water level of spring tides. Their root systems are thus regularly inundated with saline water, even though it may be diluted due to freshwater surface run-offs and only flooded once or twice a year. Mangroves depend on terrestrial and tidal waters for their nourishment, and on coastal soils and silt deposits from upland erosion as substrate for support. The tides nourish the forest and mineral rich river-borne sediments enrich the swamp. 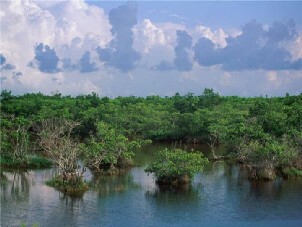 Thus the mangroves derive their form and nature from both marine and terrestrial influences. Mangroves are among the most productive terrestrial ecosystems and are a natural, renewable resource. However, the world's mangroves are beleaguered. Mangroves are losing their habitats as rivers are dammed, their waters diverted and the intertidal zone extensively developed for agriculture or aquaculture and generally dried up. Large tracts have been converted to rice fields, fish and shrimp ponds, industrial and land development and other non-forest uses. In parts of Asia, mangroves are home to thousands of families. Mangrove areas are also overexploited for fuelwood and charcoal-making. In overpopulated and acute fuelwood deficit areas, even small branches and saplings are removed primarily for domestic fuel. The depletion of mangroves is a cause of serious environmental and economic concern to many deveolping countries. This stems from the fact that at the interface between the sea and the land, mangroves play a pivotal role in moderating monsoonal tidal floods and in coastal protection. At the same time their primary production supports numerous forms of wildlife and avifauna as well as estuarine and near-shore fisheries. Consequently, the continuing degradation and depletion of this vital resource will reduce not only terrestrial and aquatic production and wildlife habitats, but more importantly, the environmental stability of coastal forests that provide protection to inland agricultural crops and villages will become seriously impaired. FAO. 1994. Mangrove forest management guidelines. FAO Forestry Paper No. 117. Rome.